I've never met him (or her!) but someone at a mail list broker has impregnated me. Yes, call it the Im-mail-culate conception. Let's be crystal clear: I AM NOT ACTUALLY PREGNANT. 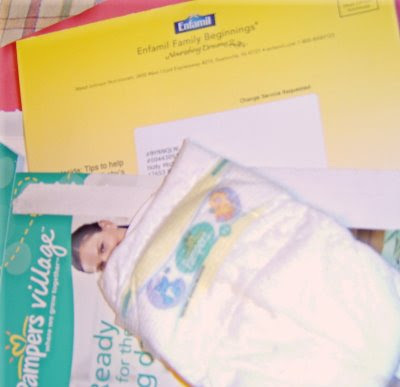 But yesterday I received a mailing from Pampers with a handy guide of what to pack for the hospital--complete with a free sample newborn diaper. I laughed it off as a weird error until today when I received the Enfamil coupon. Oh my God, someone out there thinks I'm pregnant. I'm racking my brain to think of what I could have done out there in the world of market research that would get my name added to the pregnant list. Maybe this is a joke and someone out there will read this post and see that they got me good. I know lots of women my age are still having kids, but I have a nice scar in my belly button that proves I'm outta commission. What will be next? Offers from Gerber? Pamphlets from La Leche? Am I going to have a daily piece of junk mail that is completely off the mark. What other lists am I on? Triathlete, scuba diver, stamp collector, hula instructor, perhaps. When you think about it, these largely unknown list-keepers control a lot of what you know and who reaches you. Think of the power. With a touch of a button they can mark you as old, diseased, gullible, health conscious, rich. Apparently, they can even impregnate you.